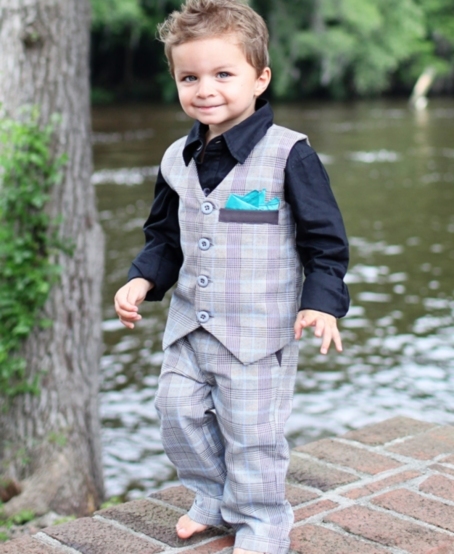 He'll turn hearts and heads with this mini business man look. 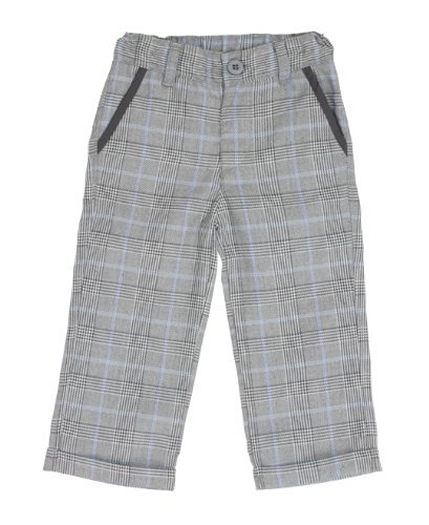 The classic gray glen plaid pants have youthful touches to be little guy faves. Accent trim on the pockets and aqua color accent throughout the material. A boy's dresswear staple. The pants sit on the hips and run slightly slim through the hip and thigh. The leg is straight and classic cut. Zip fly on all sizes. The pants have an adjustable waist beginning on size 2T. Smaller sizes have a regular front button, while toddler sizes have a false button and hidden hook closure. They are made of 65% polyester, 35% viscose. Machine washable, dry on low. The model is pictured wearing the matching vest and a black dress shirt. (The plaid has brown undertones and works well with black or brown). 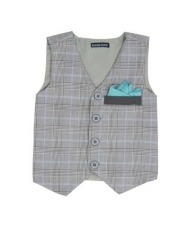 Both the vest and shirt plus a matching driver cap are sold separately and shown below.